This article was published in the Australian Financial Review on July 13th, 2018. Below is an extract; read the full piece on the AFR website here. You can also watch an interview on ABC’s The Drum, featuring Adrian talking about this article and the issues it raises, here. Wild animals aren’t usually paid to appear in ads but if The Lion’s Share initiative succeeds, that will change. Elephants, tigers and other animals could receive more than $100 million in donations from advertisers over the next three years. 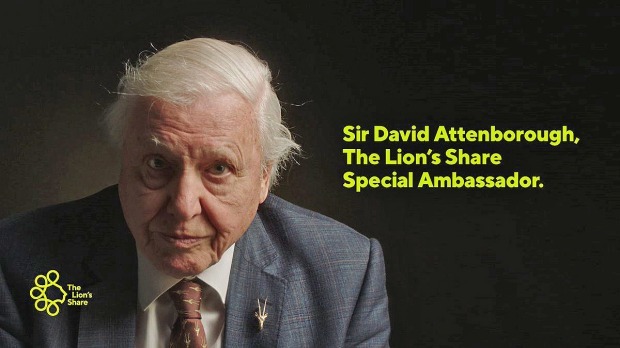 The Lion’s Share Fund was just announced at the Cannes International Advertising Festival with Special Ambassador David Attenborough, and will be launched at the UN General Assembly in September. Conceived by Australian production company FINCH, it will use a subset of artificial intelligence (AI) to identify animals in ads. CSIRO’s Data61 is providing technical advice for identifying the animals and interventions to protect habitats. It builds on Data61 work already under way to track fish in the Great Barrier Reef, monitor biodiversity in the Amazon and deter elephants from entering African villages using sensors. These are examples of AI being used for good and to create new value that didn’t previously exist, with profound benefits to the economy, society and the environment. They’re also perfect examples of why our current AI conversation is all wrong. It’s long been touted, in numerous reports from countless consulting firms, that AI will increase efficiency and replace mundane tasks with a computer program that is less taxing on both their bottom lines and human resource departments. Incrementalism and the pursuit of productivity gains is the reason many companies decide to make their data processing staff redundant, hire data scientists and shrink their overall workforce in an effort to please shareholders. At some level these consultants and companies are right, but the emphasis on incremental efficiency gains is short-sighted. They don’t embrace the true promise of AI to create new-to-the-world value; whether it’s from identifying patterns in data and making new connections, scenario-modelling to make predictions that inform better decision-making, rewiring entire value chains, or even redrawing industry boundaries. The key to achieving long-term structural change from AI lies in the power of these emerging systems to learn and modify themselves without human intervention. They are closed loop: that is, they make predictions about the future and monitor to learn if these are accurate before modifying themselves accordingly without human intervention. Always on, always learning at unprecedented scale. All fuelled by data. Case in point, we were taught to drive one-on-one before computer vision technology was introduced. Now, computer vision systems in cars learn from the experiences of the manufacturer’s entire fleet. The first encounter with a kangaroo mislabels it as a dog, the car uses machine learning – a subset of AI – to match images on the internet, and within hours every car in the fleet around the world can recognise a kangaroo. These systems will ultimately make self-driving cars safer than the way we drive as individuals without this technology, and force a restructure of the car insurance industry. We act as a network and partner with government, industry and universities, to advance the technologies of AI in many areas of society and industry.